Watching, listening, dancing and sweating with the Black Eyed Peas at our private concert! Petting a shark and stingray at the Georgia Aquarium: Stingrays (or some sort of ray) feel slimy because they are covered in mucus. Sorta gross to find out AFTER touching them. Going to an Atlanta Braves game with 4 English and 1 Norwegian: some of them knew more about baseball than I did, but that’s not saying much. Learning about new Microsoft products and technologies: Geeky yes, but I saw some pretty cool stuff that I can’t tell you about yet. Our neighbor, Brad King from the local band Take Cover, plays at open mic nights in the neighborhood. Tonight he was at Inner Chapters Bookstore & Café where there also happened to be a guy from France with his harp and another guitarist. Brad prefers to sing, so they found some songs they all knew and played them. Brad didn’t know all the lyrics to a couple of songs, so he looked them up on his iPhone and read from it while singing. It was pretty impressive since they’d never played together and they were using a harp for rock songs. I especially liked hearing Smells Like Teen Spirit from Nirvana; partially since Nirvana was the local Seattle band that started grunge music in the 1990’s, but also because it was the French guy on the harp who asked the other two “do you know this one?”. Without any practice, they just nailed it – as much as you can in a small book store. 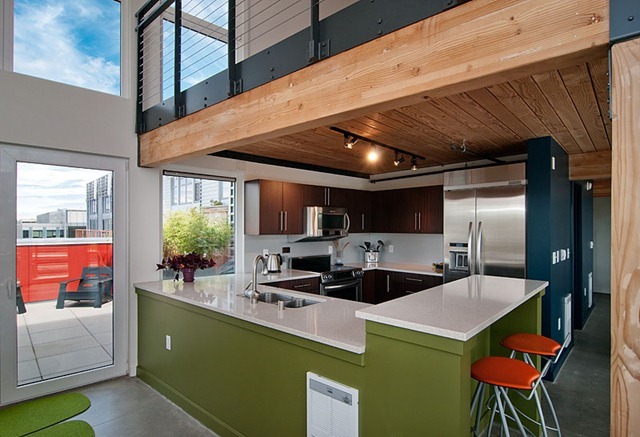 The Veer Lofts Penthouse in South Lake Union is going on the market for $649,500 on July 6th, 2010! This is a one-of-a-kind penthouse with unobstructed views of Seattle, the Space Needle, and Queen Anne Hill. 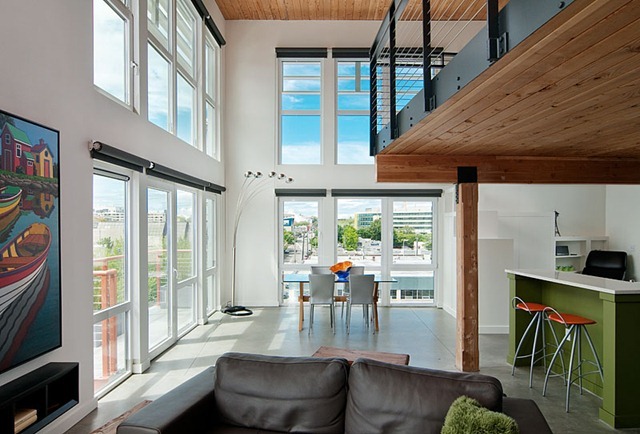 Rick Miner, our realtor has put together a very cool video of the loft too.